The Costumer has always carried a wide range of severed body parts for Halloween, haunted house, and theatrical productions such as "Pippin" or "Little Shop of Horrors". 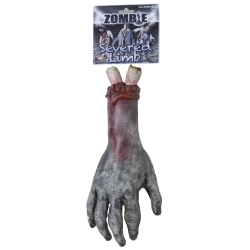 We are expanding our line to include zombie versions of the severed body parts which has a rotted zombie effect. This is the rotted zombie version of the severed hand.